SAMA…and the luck of the Irish – SWH Art Studio Inc. The American Mosaic Summit, presented by the Society of American Mosaic Artists (SAMA) was fantastic this year! The Mosaic Society of Philadelphia (MSoP) hosted the event and did a wonderful job of sharing the many riches of the City — from Reading Terminal to the Barnes Foundation, to Isaiah Zagar’s Magic Garden…and so much more! The SAMA Board of Directors and staff, led by Executive Director, Dawnmarie Zimmerman, packed stellar workshops and inspiring programs into the 5 day event. The amazing thing about this organization (and really so many no-profits!) is how so many volunteers make so much happen by generously giving their time and energy. Without them, events like this wouldn’t happen. This year’s Volunteer of the Year was Laura Rendlen, Kansas City based artist/teacher, amazing mosaic artist, and dear friend. Her SAMA volunteer focus over the years has been coordinating the Vendor’s Market. In addition to being one of the regular vendors at the Conference, I’m also one of the workshop instructors. 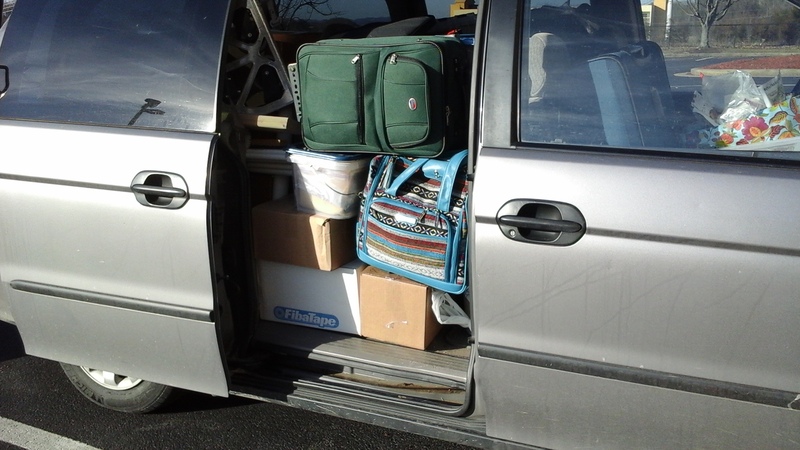 I always drive so that I can bring everything I need so packing for SAMA is like playing vehicle tetris and I’m a very good player… maybe too good. Loaded and ready to go to SAMA! I left Philadelphia Tuesday morning, March 17, Saint Patrick’s Day, and broke down out outside of Roanoke, Virginia. Good fortune was with me though. VDOT agent, Tom Jones, pull in behind my disabled vehicle and made sure the auto service was sending a reputable tow service; one that was approved by the State Highway Patrol. Total Care Service was and I was towed by Chance…the driver’s name was Chance…to the Sleep Inn in Dublin. After all, it was St. Patrick’s Day. I had hoped to be a road warrior that day and surprise my husband, Martin. St. Patrick’s Day was the anniversary of our first date. Instead, I had to call him to let him know I was stranded. I also had been talking to our mechanic, David Cataldo, Cataldo Auto Repair, Wartrace, TN. David’s not just our mechanic…he and his whole (extended) family are dear friends! I really don’t know what we do without them! Martin drove up on Wednesday…he actually left Bell Buckle at 2:00 AM, unable to sleep. 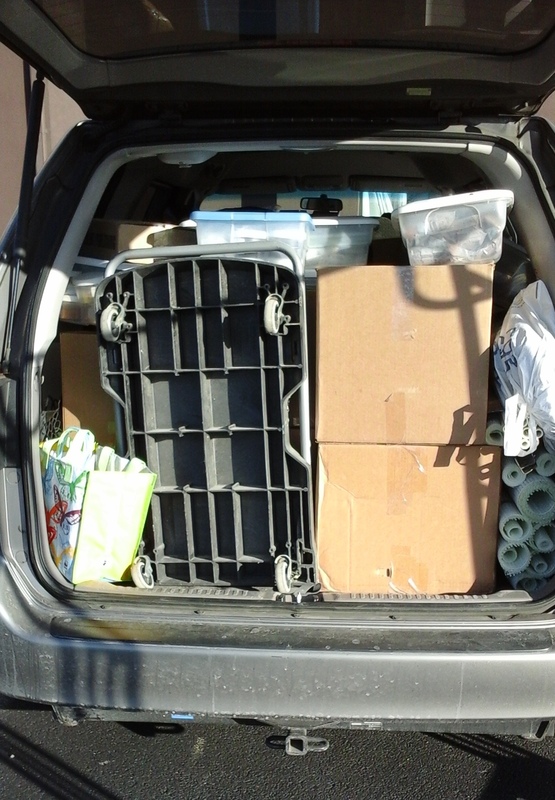 We thought we had it under control; we’d rent a car transport and drive back…not. 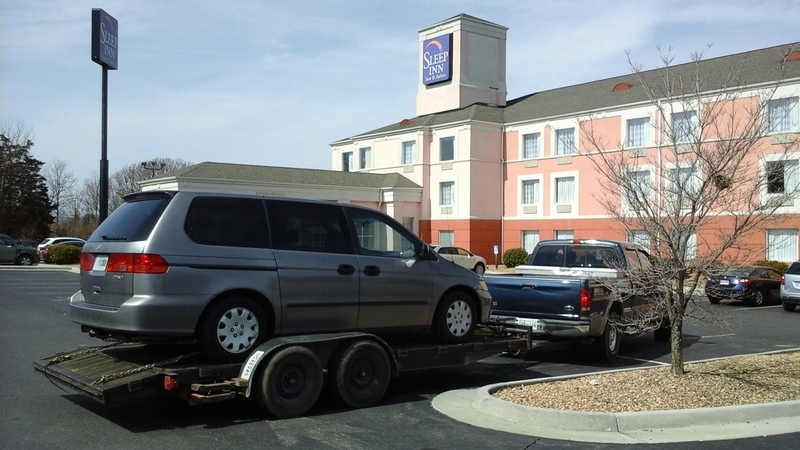 Our truck wasn’t rated heavy duty enough to tow the van so we drove home, leaving it in the parking lot of the hotel. 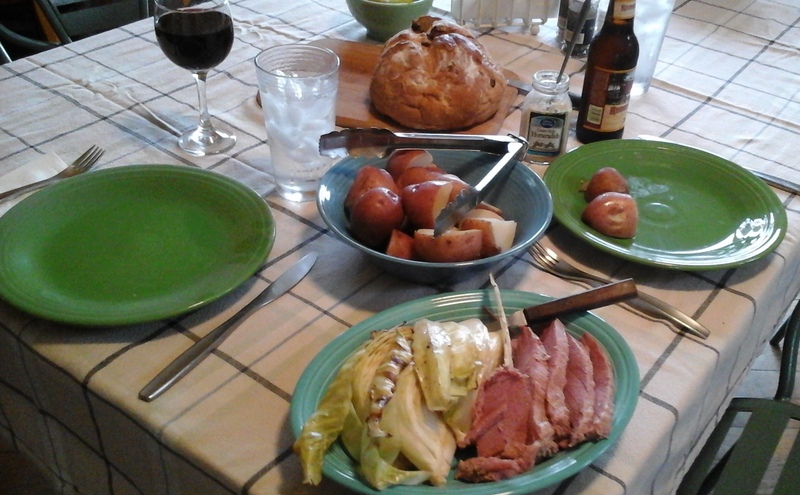 Thursday, we finally had our traditional St. Patrick’s Day anniversary dinner – corned beef, boiled potatoes, roasted cabbage, and Irish soda bread! Late but still as good as ever…as are we! Saturday, David lent us his heavy duty truck AND a trailer and we drove back to Virginia to pick up the van. Loaded and ready to go home! The past couple weeks have had some challenges but overriding the few ‘events’ have been the connection with friends, family, and the kindness of strangers! Maybe it was the luck of the Irish. March 23, 2015 by SWH Art Studio Inc. Sorry about the van troubles, roadwarrior! But, you are such good packers and travelers that this was a little hiccup helped along by “Chance”. Too funny! Take care…sure missed seeing you! I missed seeing you at SAMA too! !